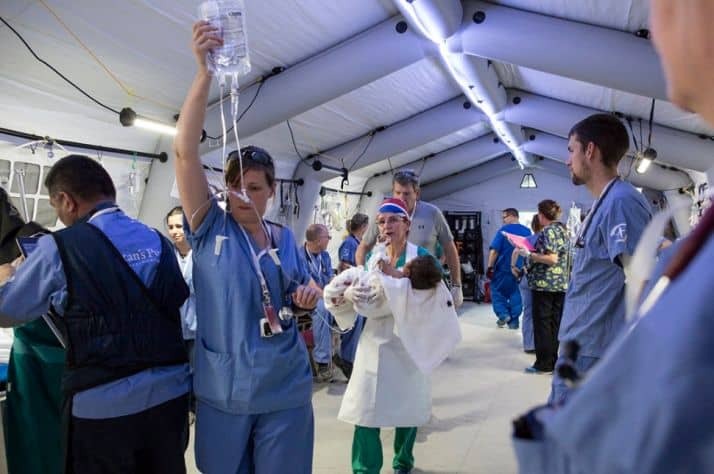 Samaritan's Purse medical personnel caring for severely injured patients at the Emergency Field Hospital in Iraq. It is the memory of a six-year-old girl who lost both her legs below the knees in a bomb blast that has stuck with Squamish nurse Ian MacKay. MacKay, 26, recently returned from his third deployment to Iraq where he worked with the Christian international relief organization Samaritan’s Purse. The Emergency Field Hospital, where he was stationed, was on the front lines, just outside of Mosul. Iraqi forces, backed by the U.S., have been fighting ISIS (the Islamic State of Iraq and Levant) for control of Mosul since October when ISIS gained control of the city, one of the largest in the country. The girl and her family were running from ISIS to the Iraqi forces, MacKay said. “ISIS opened fire on them and they ducked into a building to take cover and the door was booby-trapped with an IED (improvised explosive device),” MacKay told The Chief. The fact she was conscious was the worst part, he said, adding that he sat with her in the trauma bay for hours because, even though both her legs were “hanging off,” she was not as seriously injured as others so she kept getting bumped from the operating room schedule. The girl’s mother was the same age as MacKay, but looked twice her age, he said. He stayed with the family through the night and saw them wake repeatedly with night terrors. MacKay said women and children made up the majority of patients. Most injuries he treated were caused by shrapnel from exploding mortars and from gunfire. MacKay said he saw hundreds of patients come into the centre during his deployment and the field hospital has helped thousands since it opened in January. As of this week, ISIS retained control of only certain neighbourhoods within the city, but according to the United Nations, close to 150,000 civilians remained trapped in the city. Though MacKay has made a career of working in disaster zones, including in Haiti and Ecuador after earthquakes and in West Africa during the Ebola crises, his time in Iraq was one of the few he has felt real fear for his own life. “As a hospital of ex-pats we had a huge bulls eye on our foreheads,” he explained, adding the Mosul trauma centre faced drone attacks and the concern about suicide bombers was constant. Thick blast walls, bomb-sniffing dogs, medical detectors and armed guards, MacKay noted, protected the trauma centre. He fell into fitful sleeps to the sounds of gunfire and mortar blasts. “After spending so long out there I can tell you the difference between a coalition air strike and a car bomb,” he said. International forces have launched approximately 13,000 airstrikes in Iraq since August of 2014, according to data from Airwars, a site run by a group of journalists who monitor the war. Adjusting to life back in Squamish after all he has seen has been rough. Whenever he returns from deployments he also struggles with what people in the west prioritize. Reflecting further on his experiences in Iraq, MacKay said he has learned to remember beauty in times of crisis and that time is never promised. At least 200,000 civilians have died violently in Iraq since 2003 when the U.S. invaded, according to Iraq Body Count, which tracks documented deaths in the region. Ultimately, MacKay said he feels lucky he gets to go to the places he does and to help people in need. He is also lucky to have a great support system of people at home who help him recover enough to head back out to the next region in crisis.